Today we hear a lot about the need to integrate children into a cohesive learning paradigm based on real-world applications during play, and this approach is typically supported by STEM toys that lead to a new way of seeing the world, using a simultaneous combination of exploration and creative action. “Innovative education” leads kids to get a way of thinking that is more elastic, more free, less conformed and capable to take decisions to face reality and free their potential. Play has a crucial role in the optimal growth and development of every child, learning from infancy through adolescence in a dynamic process across the improvement of new skills and the learning to cope with everyday experiences. Nowadays by making use of new technologies it is possible to use toys in a different way; starting to look to everything and doing the play experience more complete and with endless possibilities, helping kids to build, express and free their young minds, turning them into agents of creative change. 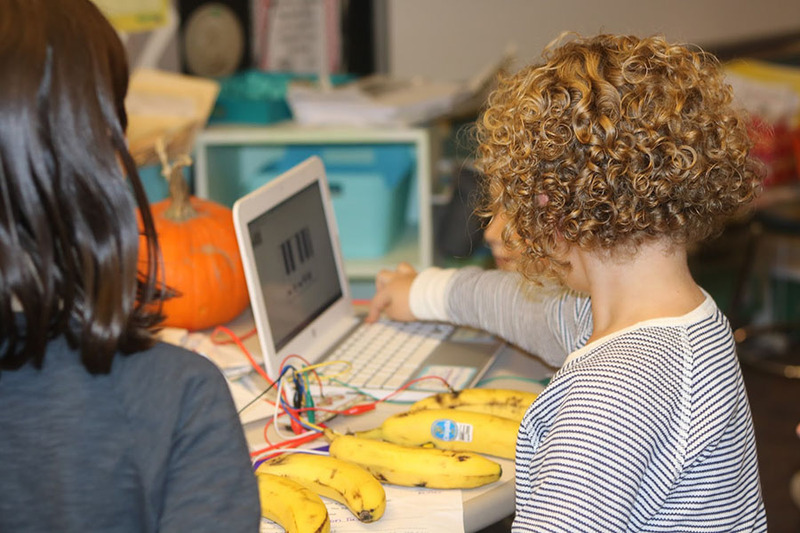 Makey Makey is an unusual construction kit designed by Jay Silver that allows kids to see the world as malleable, so they can see themselves as agents of change in their everyday lives. The main characteristic of this toy is its constructivist approach to learning which is what makes it so fun. “Users may start to believe they can change the way the world works. Extended usage may result in creative confidence”. The kids set the level of difficulty each time they play. Basically you plug it in everyday objects and it allows you to make anything that can conduct electricity as for example, can become a key on your keyboard, even with a banana. Kids can use MaKey Makey toy to make almost anything they want including using paint to compose music and even creating their own games. As we can see, it is important that design for toys also deals with education, in this case, with the way of communicating to children through the knowledge for the achievement of creativity, among other skills. “Children will start to see the landscape of their everyday life a little bit more like something they could express themselves with and a little bit more like they could participate in designing the future of the way the world works”. One of the main beliefs of TOY design is to consider the design of the educational system as a whole. Let’s think at the will of a designer to make everything work rather than the aesthetic of the object only. In the case of Makey Makey it is a technological toy inspired by the Maker Movement with the idea of helping people to start thinking at themselves as Makers and agents of change. It works like an original “construction kit” and allows to develop the creative and inventive skills in each child. The object itself doesn’t work alone, but once you connect it to another object and experiment with it, you can start to feel the world is your new construction kit. As Jay Silver considers, when people have the “Maker’s Mindset,” they know they can change the world. Thereby, let’s prepare kids to exist in society, not only as static cultural containers or as consumers, but as active and aware persons, with creative minds, who are driven by their natural curiosity, can solve their problems and achieve their goals.